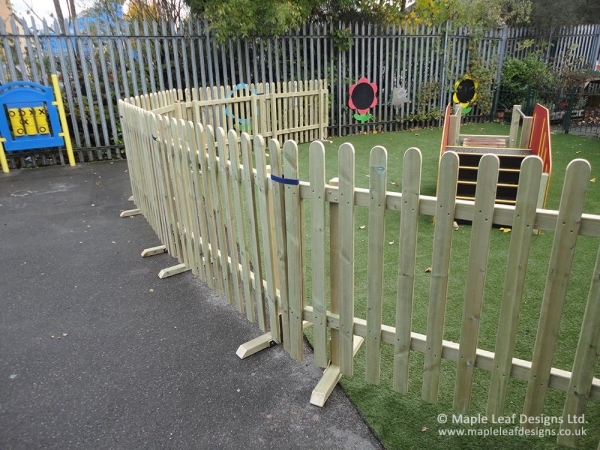 Setting clear boundaries while maintaining the flexibility of your playground is easy with our Movable Timber Bowtop Fencing panels. Unlike fixed fencing you can now alter the configuration of your playground to suit your needs from one day to the next, enabling you to create safe spaces for specific purposes as and when you need them. Each panel features a full timber construction of classic Bow Top design with long, sturdy feed at each end to prevent the panels from being pushed over. Each panel attaches to the next one with strong Velcro straps that enable speedy adjustments, set-up and pack-down times. They’re the best way to maximise the use of your playground without making any permanent alterations. Long feet to prevent pushing and tipping over. Velcro attachment for quick adjustment.